Stocks are continuing to struggle with the 24,000 level on the Dow Jones Industrial Average as investors deal with various crosscurrents. Parts of the Federal government remain shuttered. U.S.-China trade talks continue to grind on as the Chinese economy shows signs of slowing. The fate of Brexit remains unknown. And the Federal Reserve seems scatterbrained, unable to decide if it’s dovish or hawkish after the harrowing market environment in December. In keeping with the directionless feel, stocks opened strong on a Netflix (NASDAQ:NFLX) price hike, but it is now cutting gains as trade talks seem to have hit another impasse. Bank earnings have also been disappointing with Wells Fargo (NYSE:WFC) reporting the worst mortgage loan numbers since the financial crisis as the housing market slams into a wall. Caterpillar (NYSE:CAT) shares look vulnerable to a reversal as CAT contends with resistance from four-months of overhead resistance. 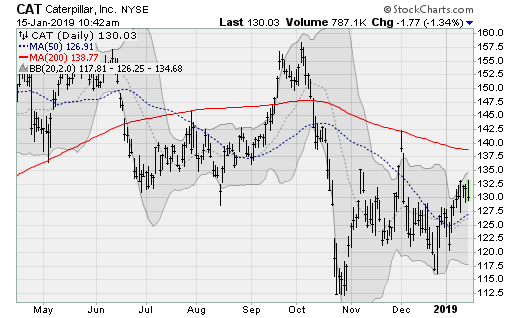 As such, CAT stock has set up a test of the recent lows near $117, which would be worth a decline of 10% from here as the U.S.-China trade talks go nowhere fast. This is poor timing for Bank of America Merrill Lynch analysts, who recently upgraded the stock to Buy. The company will next report results on Jan. 28 before the bell. Analysts are looking for earnings of $2.98 per share on revenues of $14.3 billion. When the company last reported on Oct. 23 earnings of $2.86 beat estimates by a penny on an 18.4% rise in revenues. 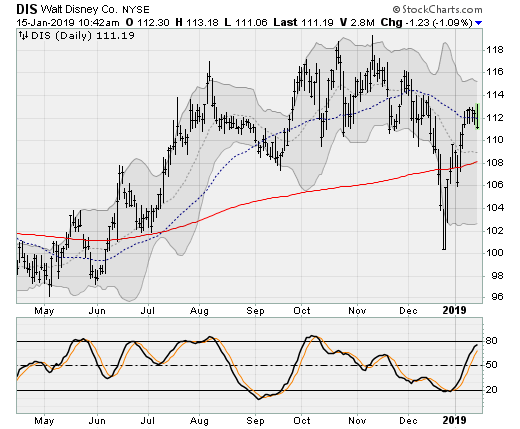 Disney (NYSE:DIS) shares are suffering a sharp reversal lower, falling back below its 50-day moving average to form a “bearish engulfing” candlestick that presages more weakness ahead. Not exactly the behavior investors were looking for ahead of the opening of the eagerly awaited Star Wars theme park areas in Disneyland and Disney World. DIS will next report results on Feb. 5 after the close. Analysts are looking for earnings of $1.6 per share on revenues of $15.4 billion. When the company last reported on Nov. 8, earnings of $1.48 per shear beat estimates by 13 cents on an 11.9% rise in revenues. 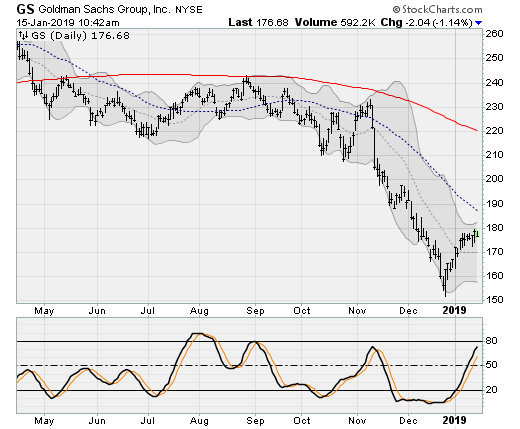 Shares of Goldman Sachs (NYSE:GS) have stalled out near resistance at the $180-a-share level, setting up a likely reversal that tests the lows set in late December. Financial stocks overall are showing weakness this morning after earnings results from WFC and JPM revealed problems in mortgage loan activity and fixed income trading. The company will next report results on Jan. 16 before the bell. Analysts are looking for earnings of $5.4 per share on revenues of $7.9 billion. When the company last reported on Oct. 16, earnings of $6.28 per share beat estimates by 94 cents on a 3.8% rise in revenues. Shares of Home Depot (NYSE:HD) are rolling lower after testing highs previously set in November and December. 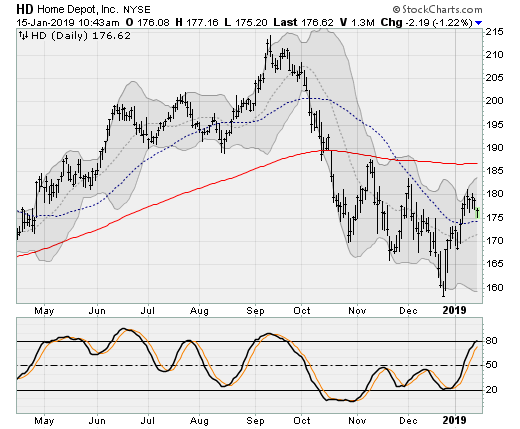 HD stock is remaining below its 200-day moving average as the one-time momentum favorite succumbs to the realization that the U.S. housing market is in trouble — plagued by a combination of higher mortgage rates, absurd pricing and impacted affordability. The company will next report results on Feb. 12 before the open. Analysts are looking for earnings of $2.2 per share on revenues of $26.6 billion. When the company last reported on Nov. 13, earnings of $2.51 per share beat estimates by 24 cents on a 5.1% rise in revenues. 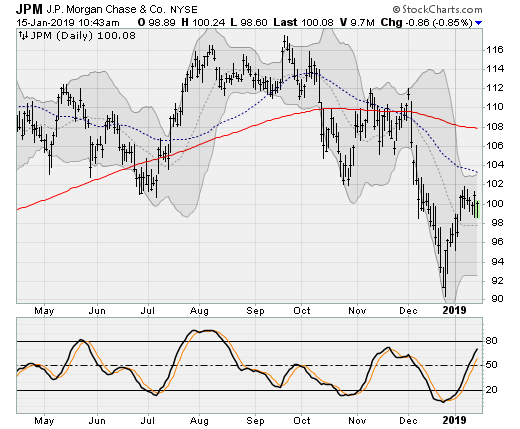 Shares of JPMorgan (NYSE:JPM) are struggling to stay above the $100-a-share level and remain well below their 50-day and 200-day moving averages. The company reported results before the bell. Earnings of $1.98 per share missed estimates by 21 cents on an 8.1% rise in revenues. Management cited a decline in fixed income trading revenue, which dropped 16% from last year. When the company last reported on Oct. 12, earnings of $2.34 per share beat estimates by 8 cents on a 7.8% rise in revenues. Watch for a test of the late December low as shareholders realize that loan growth and credit quality is vulnerable, setting up a 10% drop from here. 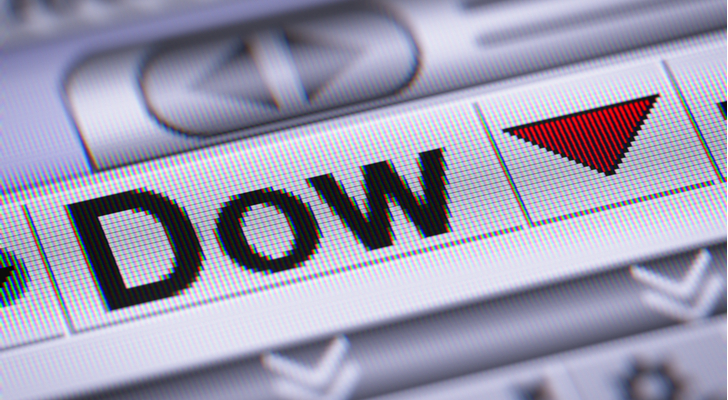 Article printed from InvestorPlace Media, https://investorplace.com/2019/01/dow-jones-stocks-to-sell-before-things-get-uglier/.